Is bread healthy? Can you eat bread and still lose weight? Ever since dieters became nervous about carbs in their diets, bread has been on the forbidden list of many eating plans for weight loss and weight maintenance. The carbs and calories in a slice of bread can add up quickly if you're not careful. But you can eat bread and lose weight, and certain types of bread can even be part of a healthy eating plan. Bread nutrition varies depending on the type of bread that you choose to eat. Nutrition and health experts recommend that you increase your intake of whole grains, so choosing a whole wheat bread is usually a smart choice. A single slice of commercially prepared whole wheat bread (shown on label) provides almost 70 calories and about 1 gram of fat. The slice also provides almost 4 grams of protein and 11.6 grams of carbohydrate. But since it also provides about 2 grams of fiber, you'll only consume about 9.6 net carbs per slice. Remember, however, that you need to double those nutrition counts if you make a sandwich with two slices of bread. So what about other types of bread? Commercially prepared white bread provides about 80 calories and 1 gram of fat. White bread is likely to provide 15 grams of carbohydrate or more and since there is less than one gram of fiber in white bread, your net carb intake will be about the same. 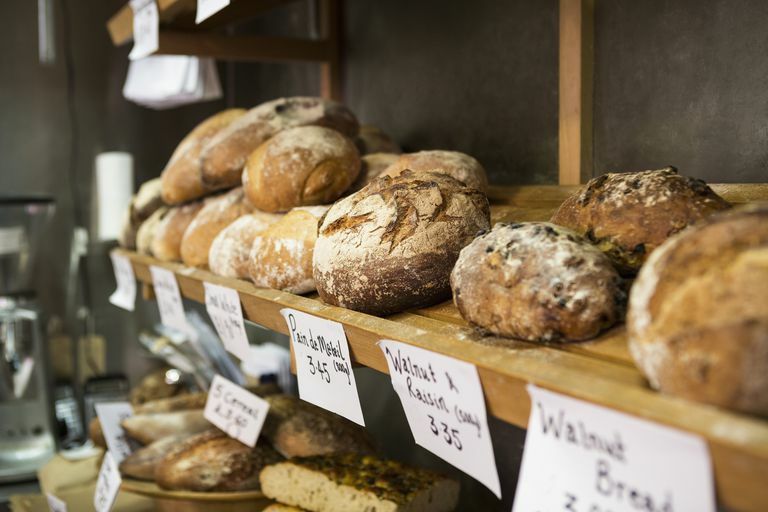 Rye bread may or may not be made from whole grains depending on the brand that you buy. It may also be made from a mixture of refined grains and whole grains. A typical slice of rye bread provides 65 calories, about 1 gram of fat, 12 grams of carbohydrate, 1.5 grams of fiber, and 2.1 grams of protein. The brand and variety of bread makes a difference in the number of calories per slice. If you compare different types of bread, you'll notice that the size and thickness of the slice can vary signficantly. Also, keep in mind that whole grain breads tend to be higher in calories but you gain the benefit of insoluble fiber that provides health benefits and is not absorbed by the body. Wonder Classic White Bread: 65 calories, .75 grams of fat, 12 grams carbohydrate, 1 gram fiber, 2 grams of sugar, 2 grams protein. Pepperidge Farm Soft 100% Whole Wheat Bread: 70 calories, .75 grams of fat, 12 grams carbohydrate, 2 grams fiber, 1.5 grams of sugar, 3 grams protein. Food for Life Ezekiel 4:9 Sprouted 100% Whole Grain Bread: 80 calories, 0.5 grams of fat, 15 grams carbohydrate, 3 grams fiber, 0 grams of sugar, 4 grams protein. Food for Life Gluten-Free Brown Rice Bread: 110 calories, 2.5 grams of fat, 19 grams carbohydrate, 1 gram fiber, 1 grams of sugar, 2 grams protein. Orowheat 100% Whole Wheat Bread: 90 calories, 1 gram of fat, 16 grams carbohydrate, 2 gram fiber, 3 grams of sugar, 4 grams protein. Arnold Organic Rustic White Bread: 130 calories, 1 gram of fat, 25 grams carbohydrate, 1 gram fiber, 3 grams of sugar, 4 grams protein. Arnold 12 Grain Bread: 110 calories, 3 grams of fat, 19 grams carbohydrate, 3 grams fiber, 3 grams of sugar, 5 grams protein. Pumpernickel (made at home from scratch and sliced thin): 50 calories, 0.6 grams of fat, 10 grams carbohydrate, 1.3 grams fiber, 0.1 grams of sugar, 1.7 grams protein. Sun-Maid Raisin Bread Cinnamon Swirl: 100 calories, 1.5 grams of fat, 18 grams carbohydrate, 1 grams fiber, 8 grams of sugar, 3 grams protein. The healthiest bread for you will depend on your nutritional goals. You might be trying to reduce your sugar intake or increase your daily fiber. Some bread eaters are trying to eat more protein. Use the nutritional label rather than front-of-package product claims to guide your decisions. Note that the nutrition facts listed above are for a single slice of bread. If you check for bread calories on the package, you'll see that two slices is usually listed as a single serving because that is the amount typically consumed in a single eating occasion (an amount referred to as the NLEA serving size by industry experts). Bread provides calories (energy) primarily in the form of carbohydrate. Carbs are your body's preferred energy source. So when you eat bread, you provide your body with fuel for your daily activities. If you choose bread made from whole grains, you also provide your body with fiber. Fiber provides several health and weight loss benefits. Eating foods with fiber can help you to feel fuller and more satisfied. Weight loss experts generally recommend that dieters consume foods with fiber to help them eat less and create the calorie deficit needed for weight loss. Depending on the bread that you buy, it may also be a good source of micronutrients including thiamin, selenium, and folate. You may see the word "enriched" on the commercially prepared bread that you see in the grocery store. Enriched foods have had nutrients added back in during processing. Most often, nutrients have been stripped away during the manufacturing process. Enriched products are usually made from refined grains, or grains that have been processed so that the whole grain is no longer in tact. Why is whole wheat bread better for my diet? If you are trying to lose weight, you'll notice that eating foods with fiber, like whole grain bread, will curb hunger for a longer period of time after eating. This helps you reach and maintain a calorie deficit. How do I know if my bread is made from whole grains? Don't rely on the front of the bread package to determine if your bread is made from whole grains. Many times, food manufacturers use words like "multigrain" to make their food sound more healthy. Instead, check the ingredients list. Whole grains (like whole wheat, wheatberries, whole oats) will be listed as one of the first ingredients. The Whole Grain Council provides a comprehensive guide to deciphering labels to find whole grain foods. Is white bread bad for me? White bread isn't necessarily bad for your diet, but it provides calories (energy) without as much nutrition as whole grain bread. What are some healthy alternatives to bread? If you're trying to cut back on bread, there are several alternatives to bread that you can try. For example, did you know that you can make a sandwich using a cucumber instead of bread? And many healthy eaters wrap their healthy beef or turkey burger in lettuce rather than using a bun. There are many brands of commercially prepared low calorie breads on the market. Keep in mind, however, that these breads may be lower in calories, but also lower in nutrition than a slice of low grain bread. In addition, sometimes bread is lower in calories because the slice is smaller or thinner than a traditional slice. There are many healthy ways to include a slice of bread in your diet, so if you love bread, keep eating it. But consume it in moderation. Enjoy an open-face sandwich instead of using two slices of bread. And instead of having bread with high-calorie jam and butter in the morning, have a few slices of apple topped with peanut butter. One of the best ways to cut back on bread is at the restaurant. Ask your server not to bring bread to the table before your meal. Mindless pre-meal snacking can add hundreds of calories (not to mention carbs and fat) to your waistline. Why Is Oatmeal Considered So Healthy?